We are in receipt of your Form 668-W regarding one (worker's name). (Company name) is committed as a matter of policy, and civic duty, to upholding the law, and it is our sincere desire to comply with all lawful obligations to which we are subject. You suggest such an obligation in your form, but we are troubled by what appear to us to be several areas in which your presentations, the statutory authority under which they are made, and the facts regarding (worker's name) do not seem to mesh well. We have read the statutes under the authority of which you claim to be acting (represented at 26 USC 6331 and following), including the portions which you have omitted from the back of your form. 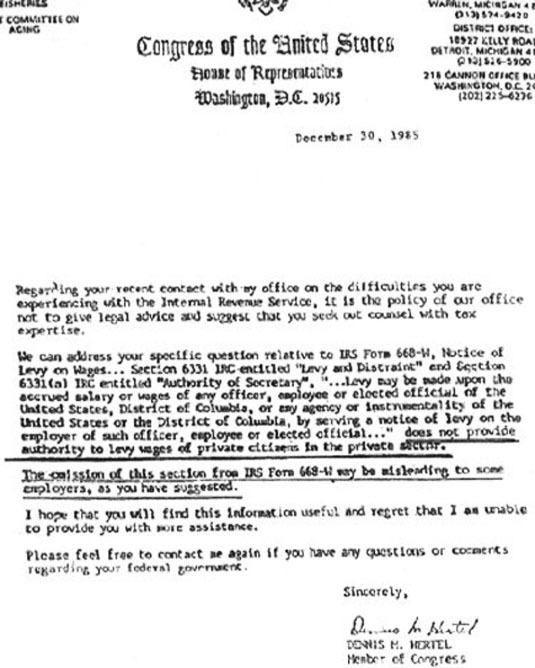 The statutes specifically and exclusively identify federal workers (meaning those working directly for the federal government and those working for federally-connected entities) as entities whose unpaid compensation can be attached by way of a 'Notice of Levy' (and then, of course, only when liability has been properly established): "6331(a)... Levy may be made upon the accrued salary or wages of any officer, employee, or elected official, of the United States, the District of Columbia, or any agency or instrumentality of the United States or the District of Columbia, by serving a notice of levy..."
(ii) State and municipal employees. 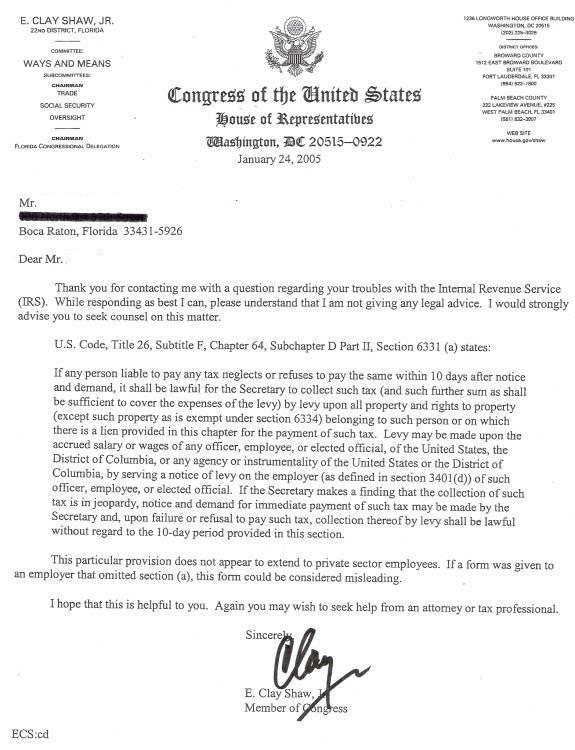 Salaries, wages, or other compensation of any officer, employee, or elected or appointed official of a State or Territory, or of any agency, instrumentality, or political subdivision thereof, are also subject to levy to enforce collection of any Federal tax. (iii) Seamen. Notwithstanding the provisions of section 12 of the Seamen's Act of 1915 (46 U.S.C. 601), wages of seamen, apprentice seamen, or fishermen employed on fishing vessels are subject to levy. We presume that 'State and municipal employees' and 'Seamen' refer to those of the federal States, municipalities and Territories (as defined in the relevant revenue statutes), and federally commissioned mariners, respectively; however, such details are moot. The inclusion of these specifications unambiguously contradicts any suggestion that the authority of the levy power in regard to compensation can or should be presumed as extending beyond those entities specified, for were that actually the case, subparagraphs (ii) and (iii) cited above would be entirely superfluous and redundant. If the compensation of literally any person actually can be, or lawfully is, reached by these levy provisions, then no further specification would be needed. That these specifications are provided proves that this is not so. Within the context of the statute, 'any person' clearly DOES NOT mean "each and every American", it means "any person that is among the groups specified". "In the interpretation of statutes levying taxes it is the established rule not to extend their provisions, by implication, beyond the clear import of the language used, or to enlarge their operations so as to embrace matters not specifically pointed out. In case of doubt they are construed most strongly against the government, and in favor of the citizen." As our obligation to (worker's name) is entirely unambiguous, we find it impossible to honor your directive without clarification. clearly offers indemnification only as to the surrender of property "subject to levy upon which a levy has been made", which is to say, property upon which a levy CAN be made, and upon which a levy HAS been made. Thus, the indemnification only protects us if the property you are seeking IS "property [lawfully] subject to levy,"AND if a levy has been lawfully made upon that property. Not only does it appear self-evident that neither of these requirements have been satisfied in regard to your demand, but you have furnished no evidence of any kind to the contrary-- not even so little as a sworn declaration by someone in your organization willing to take personal responsibility for your representations as to these matters. Please also note the enclosed letters from Congressmen regarding this issue which we base our request on. I declare under penalty of perjury that all of the foregoing is true to the best of my knowledge and belief.